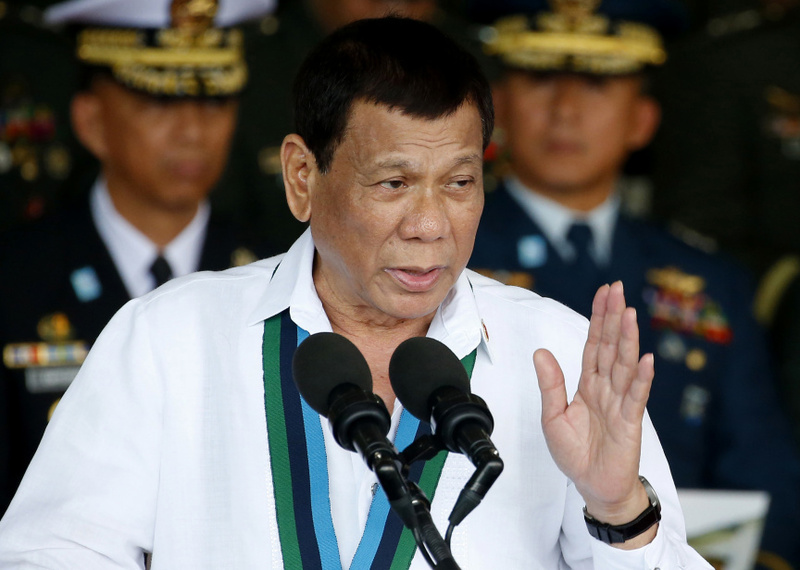 MANILA, Philippines (AP) — President Rodrigo Duterte announced Wednesday that the Philippines is withdrawing its ratification of a treaty that created the International Criminal Court, where he is facing a possible complaint over thousands of suspects killed in his anti-drug crackdown. Critics expressed shock at Duterte's decision, saying he was trying to escape accountability and fearing it could foster an even worse human rights situation in the country. Others called the move a foreign policy blunder that could embolden China to scoff at Manila's victory in an international arbitration case against Beijing over contested territories. An ICC prosecutor announced last month that she was opening a preliminary examination into possible crimes against humanity over alleged extrajudicial killings in Duterte's drug crackdown, angering the president. Duterte said Wednesday that the court cannot have jurisdiction over him because the Philippine Senate's ratification in 2011 of the Rome Statute that established the court was never publicized as required by law. He called the failure to make the ratification public a "glaring and fatal error." Thousands of mostly poor drug suspects have been killed under Duterte's drug crackdown. He argued Wednesday that the killings do not amount to crimes against humanity, genocide or similar atrocities. "The so-called war against drugs is lawfully directed against drug lords and pushers who have for many years destroyed the present generation, specially the youth," Duterte said in a 15-page statement explaining his legal position. "The deaths occurring in the process of legitimate police operation lacked the intent to kill," Duterte said. "The self-defense employed by the police officers when their lives became endangered by the violent resistance of the suspects is a justifying circumstance under our criminal law, hence, they do not incur criminal liability." Duterte also invoked presidential immunity from lawsuits, which he said prevents the ICC from investigating him while he is in office. The president renewed his verbal attacks against U.N. human rights officials who have expressed alarm over the massive killings. He said the U.N. expert on extrajudicial killings, Agnes Callamard, had without any proof "pictured me as a ruthless violator of human rights" who was directly responsible for extrajudicial killings. He also criticized ICC prosecutor Fatou Bensouda, who announced last month that she is opening a preliminary examination into the killings. Last Friday, the United Nations' human rights chief, Zeid Ra'ad al-Hussein, suggested that Duterte "needs to submit himself to some sort of psychiatric evaluation" over his "unacceptable" remarks about some top human rights defenders. Zeid demanded that the Human Rights Council, which counts the Philippines among its 47 member countries, "must take a strong position" on the issue, and insisted "these attacks cannot go unanswered." He has lashed out at European governments, saying they should "go to hell" for imposing conditions on financial aid. Opposition Rep. Carlos Isagani Zarate called Duterte's move to withdraw the country from the Rome Statute a "grave setback to human rights and accountability." It is "intended to escape accountability by present and even future officials for crimes committed against the people and humanity," Zarate said. Another opposition lawmaker, Tom Villarin, said Duterte's action "would have unprecedented repercussions on our international standing as a sovereign state." Villarin said it could also embolden China, which has refused to comply with an international arbitration ruling that invalidated its vast territorial claims in the South China Sea under a 1982 U.N. treaty. The Philippines filed and largely won the arbitration case.